I visited the show on Wednesday 26th May – I left home very early as I wanted to ensure I got to take some good pictures with as few people around as possible. It was busy but the RHS deciding to put a limit on the number of tickets sold has helped - especially with circulation in Main Avenue and Eastern Avenue. Last year I only managed an hour at the show – so I was determined to see everything...! And I did! 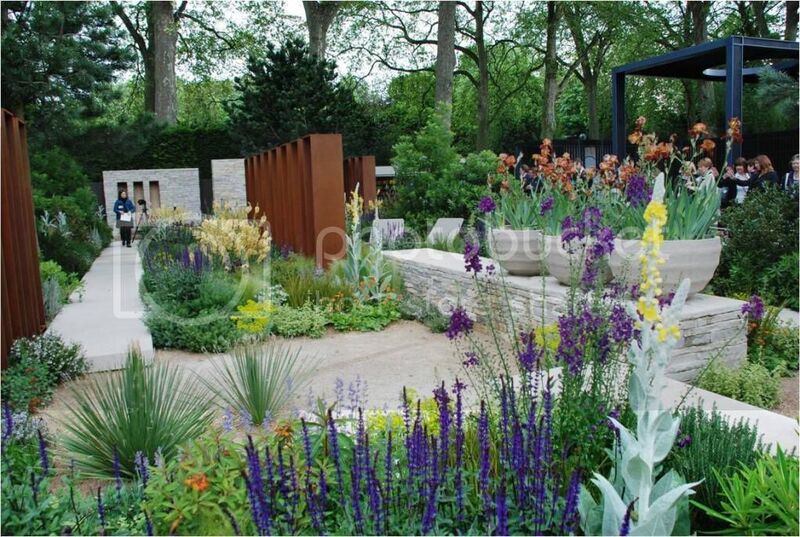 Let’s start with the Show gardens of course, a few gold medals this year- meaning a high standard of work. People think medals are awarded on how nice it looks, but they are awarded on how the designer has adhered to the brief that has been accepted, any divergence from it, and you get penalised. They also award points for quality of plants, plantsmanship and hard landscaping construction. Does the design flow, meld together well, does it do what it says on the tin? The tin being the brief – if it’s all good you get that coveted shiny gold medal. Well I liked a few, shuddered at a few and I loved a few! That’s good – there is something for everyone and my tastes are obviously different to the next person. As a designer I am looking at these in a more ‘design’ manner- I look at planting, construction, materials used, flow, balance, etc.... Anyway onto the show gardens in no specific order and also I have not covered every single garden! I will post a Flickr gallery and a more extensive blog over the weekend on my own website. The Kebony Norwegian Garden – designed Darren Saines. This garden used traditional materials and is kind to the environment. I looked at this from the path down towards the cabin and I was at first taken aback by the lugubrious look, the 40 year old stunted pine feature did not help- a case of because it’s old it does not mean it’s nice looking. But then as I moved around I liked it more and more. I think because it was under larger trees (the ones normally there) it did make it dark and the coolish weather and grey skies doing not help. But the planting was wistful with touches of blue and purple to lift the very green grass and blonder ornamental grasses. I am not sure about blue on the pavilion – the shiny glass tiles jar with me, too clinical and blue. Silver Gilt. The Victorian Avery Garden - I really struggled with this garden, it was designed head on with symmetrical parterres on either side of a mosaic-type path. First the colour, was really strong with gold embellishments, and that blue was dull, almost teal. The materials were numerous: stone, mosaic, wood, natural stone raised walls topped with slabs. Too many, too fussy. Beautiful aviary but so tall it towered over the garden which was short at the front. Not just a focal point – it swamped the garden completely. The beds were mixed flowers with the ubiquitous pyramid tree in the middle. So too much everywhere for my taste. Designed by Jonathan Denby and Philippa Pearson. This traditional structure needs a huge garden to show the artful design! Silver. 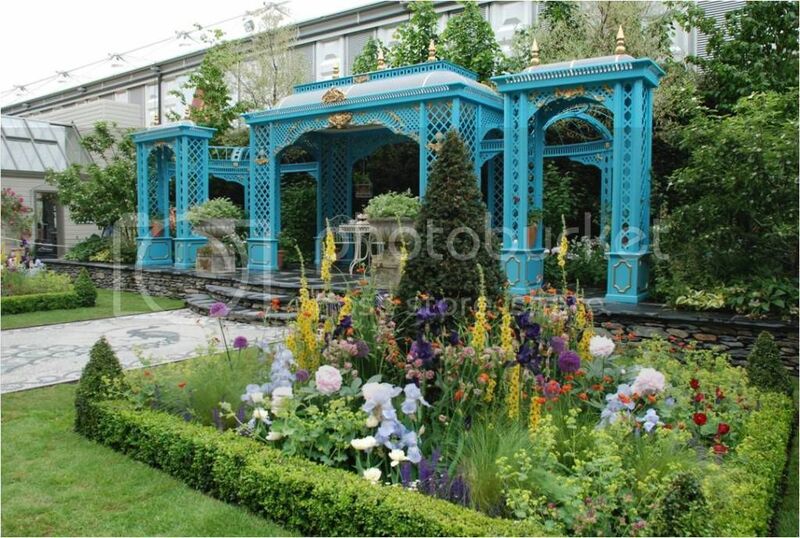 The Laurent-Perrier Garden - from Stuart-Smith is my very favourite designer – he inspires me. A talented plantsman, a focused and detailed eye for structure, symmetry, counter-pointed with restrained bouts of elegance..... but this time I was left.... ‘so where’s the rest?’ The planting was skilful but not inspired, on mostly one level for shrubs, in the green palette and box balls on the other side of the rectangular pool. Restrained? Yes, Cool and fresh? Yes. Do I remember it; did it hit me between the eyes? No. It was elegant and romantic but a tad bland. The bronze pavilion overlooked a spring woodland planting and the strong structure did contrast very well with the naturalistic planting scheme. Lots of textures but when it’s all in the same palette, it is difficult to appreciate. I liked the Birch grove. Gold medal. The Daily Telegraph Garden–designed by Andy Sturgeon. I liked this one very much. I was a tad confused but the numerous “walls” or separations. These separations are often used by designers as a tool to define space and control views and vistas. Looking at the plan now, I can see what he was trying to do. A measured walk to the courtyard at the back. The link between the gravel and the planted areas is inspired, going from sparse planting in gravel to smooth light natural stone paths to an afro-latino-english planting scheme. Sounds weird but it worked – the exotic plants were few, the heat loving plants with greyish foliage were highlighted with English colour here and there. A hot garden tempered by cool and whitish looking stone and planted bowls. The Corten steel structures a definite contrast. I really liked it. Gold and voted Best in Show. I’m pleased for him as he has had a tough year – father to 3 boys and his wife died suddenly in her sleep – it takes a lot of courage to deal with that and get on with it. The Cancer Research UK Garden – waow! This was huge! Not bigger than Andy’s above but the use of colour and light between the structure and the circular pool paved with light stone is a master class in the juxtaposition of formal and informal. The path leading to the terrace is fantastic, the rough granite planks are superb- it gives the path relief and the panting looks like it’s lifting from the ground in places. It creates subtle shadows – again a play on light and dark. Designed by Robert Myers, this is elegant, calm, going from informal monochrome planting with white Birches to a formal area with more exuberant planting. The water is reflective and turns this into a light, floating but very grounded garden. I loved it. Gold. The Tourism Malaysia Garden- waow waow and waow! My pictures do not do this garden justice. I was expecting the usual pastiche of exotic flowers, vibrant colours, strong lines and no softness. Wrong. I was so wrong. It was green, lime green soft green, dark green, every kind of green. The different leaves were long and smooth, short and spiky, the trunk of the larger trees were black contrasted with yellow-green fronds. Amazing. Designed by James Wong of ‘Grow your own drugs’ fame and his design partner David Cubero, a thoroughly modern garden surfaces through floating white limestone paths and slabs cutting through a very exotic flora and reflected in water. But this is not the usual exotic garden – simple, varied and showing an amazing array of plants, this garden was breathtaking. The Green & Black Forest Garden – a garden with a message. True to their ethical and fair trade beliefs, G&B wanted to raise awareness for the challenges that Cameroon and its inhabitants face. This garden is about change and how the indigenous people have had to adapt and start growing food which they can sell commercially. 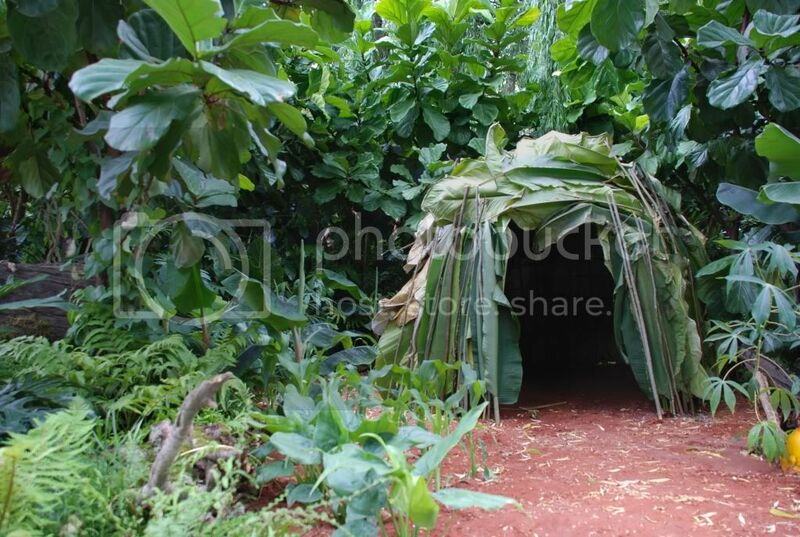 The Mogulu is a leaf house typical of the Baka and Begyeli tribes. Akin to a forest garden, the people cultivate bananas on the edge of the rainforest. The planting was composed of crops such as Cassava, Maize along with the Monstera deliciosa- Cheeseplant to you and me, and different types of Phylodendrons. I liked this- it was like peering through a dense undergrowth to look at a tribe without them knowing. People around me loved it, the ooohs and aaaahs were plentiful- who would have thought that a simple sheme would appeal to a public usually hungry for lots of different plants? Gold. Eden Project – Places of Change – not so much a garden but more of an exhibit. Again another message garden created with socially excluded people within our communities- apparently over 450 of them participated in creating this garden. With different areas showing fruit and vegetables, medicinal plants and many others, I loved this- it was messy but full of amazing ideas on recycled materials. The everyday detritus was used up to become sculptures within the garden, recycled plastic bags to adorn tree branches, wine corks used as mulch to keep the soil moist, weeds became plants to decorate old trellis fencing, pieces of wood were painted and planted within the garden to create height and also give it flow. I loved the doors! Framed doors, painted and decorated with graffiti were sculptural, colourful and made me smile. Definitely not most people’s idea of a garden or perhaps most people’s idea of what a re-use, re-cycle garden would look like – but this is not what it’s about, being a perfect lawn or flower. It’s about the communal work that went into making something rather beautiful and almost ethereal – with rubbish and stuff that most people discard within our communities. Silver. Ace of Diamonds Garden – the one everyone was talking about! Well I was rather...speechless. There always seems to be a garden that is shiny, shiny and more shiny! This one is no exception. Straight off I hated it – there I’ve said it – seriously huge plastic diamonds and coloured stones were scattered throughout the space. The gold glittery edging shone and the huge Amethyst in the corner along with semi-precious stone panels on the walls were....shiny.... I could not see anyone actually enjoying sitting in it with so much fighting for one’s attention! The crowds were...quiet but they did gather, I guess any publicity is good publicity? Bronze. 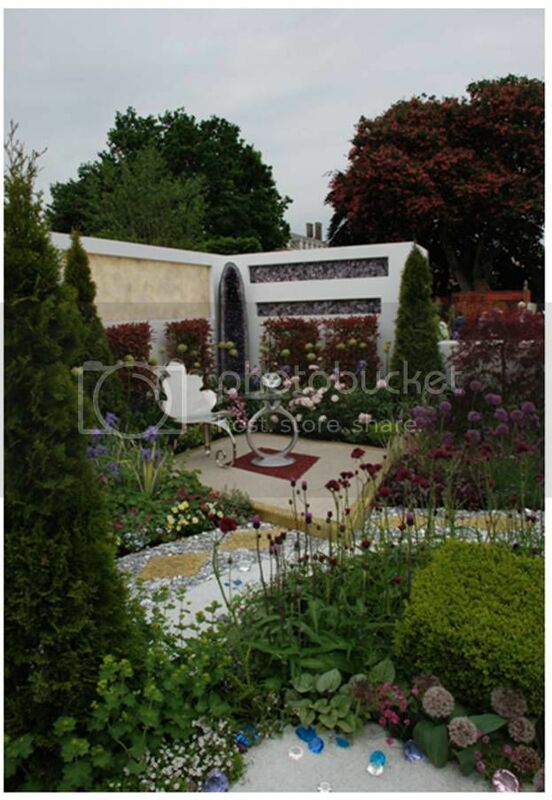 We can’t feature them all here but you can go and check more out more at the Chelsea Flower Show website. The RHS website has all of the gardens with pictures and 3D video screen. The planting plans are all attached to each garden. I loved this head- letters jumbled up all over it, representing what it feels like have dyslexia. 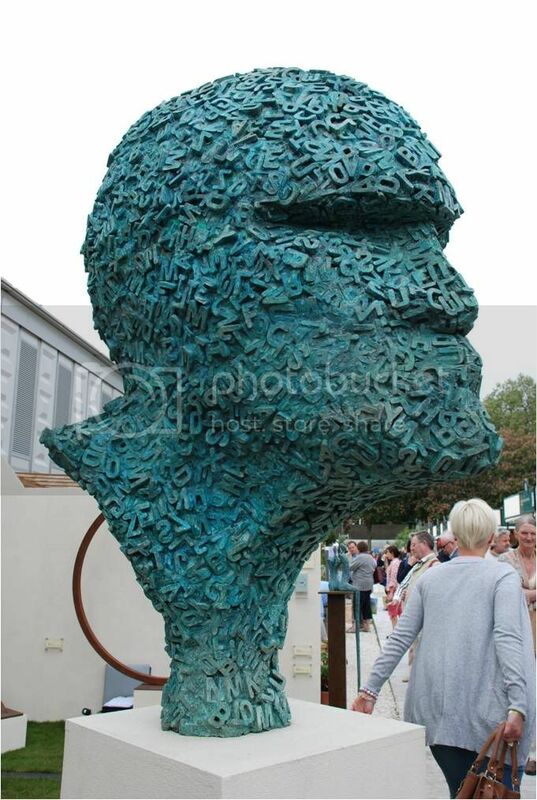 Sculptures from Michael Speller’s stand were amazing. An artist based in Southwark, he has been commissioned to create works for the upcoming Olympics. Michael has very recently installed a 12 ft sculpture on short term loan in the Royal Lounges of Terminal 5 Heathrow. The prestigious nature of the venue and the number of people transiting the area will he hopes promote interest in a larger project that would become a positive legacy of the 2012 games. Another artist Tom Stogdon and superb 3d stone sculptures, I particularly liked this one, from his Metropolis series. I liked the stacked form. His work is 3D and wall art. 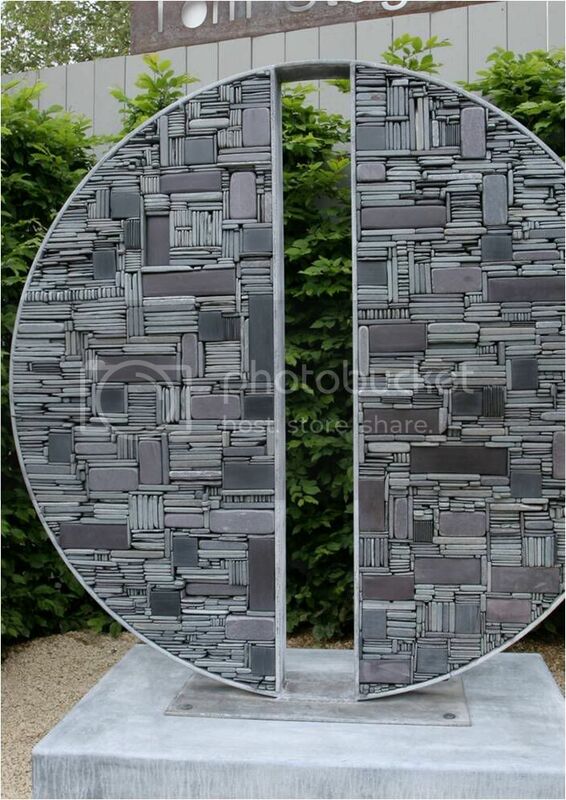 Some clients of mine have actually bought one of his sculptures for the new garden I designed for them and which will be built over the coming winter. Lastly I liked these benches, made by Moore Designs in Sussex. 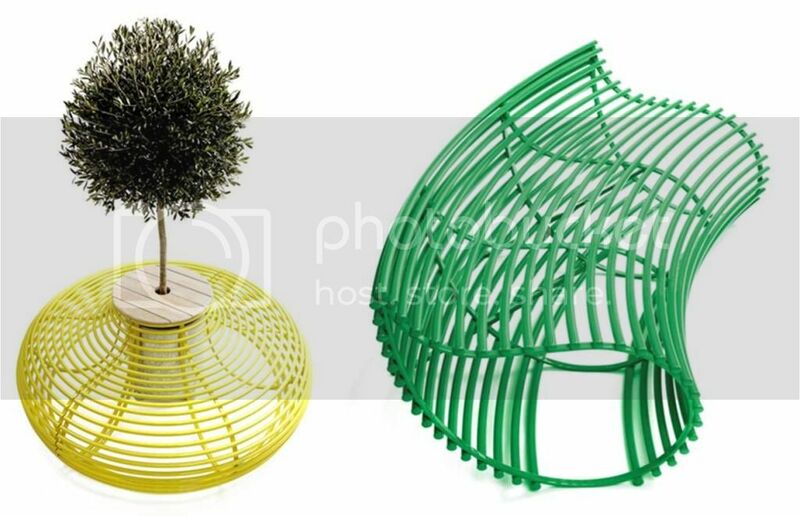 Contemporary metalwork that would work well in any garden style. Light on its feet but solid, I particularly liked the tree seat and the green bench. Simple, sculptural, architectural and hard wearing.